Today I’m teaming up with Kroger to bring you all a little gift. Okay, TWO gifts. Because today’s giveaway will have TWO lucky winners, each winning a $100 Kroger gift card. Have you all joined Pinterest yet? It’s really one of my favorite places to spend time. I feel it’s a great place to not only get inspired, but also organize my recipes. With the holiday approaching, it’s time to think about meal planning. Kroger is here to help you all (and me!) not only plan our meals, but help pay for them too! 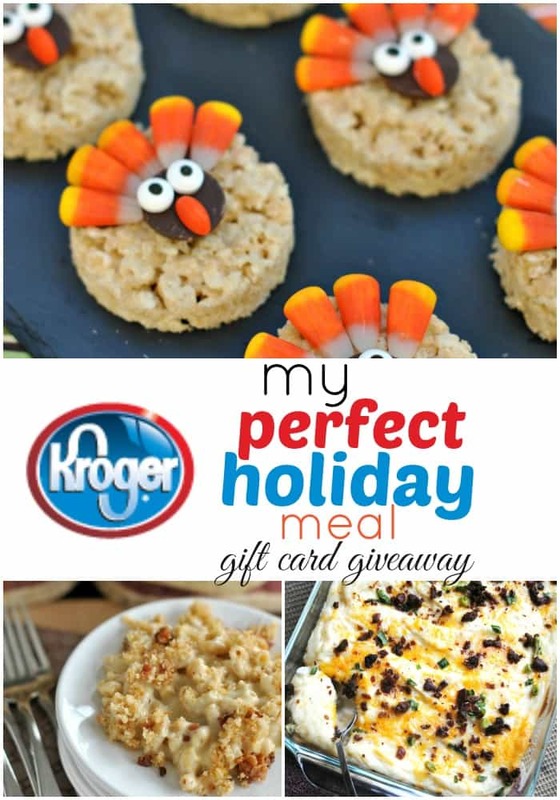 Kroger has put together their “Perfect Holiday Meal” Pinterest Board. It’s filled with traditional holiday meal items, including turkey, ham, mashed potatoes, stuffing, green beans, dinner rolls, cranberry sauces and desserts. **THIS GIVEAWAY IS NOW CLOSED!!! ** thank you to all who entered! Create a fun Pinterest Board with “Your Perfect Holiday Meal” theme. Sitewire and myself will choose TWO winners from the comments below. You can see I tend to include a few extra desserts on my board! What will YOU include on your Perfect Holiday Meal Board? Get creative, I can’t wait to see what you come up with! How will YOU spend the $100 gift card if you win? Love it! Those macarons look delicious! Here is my board…I can’t wait for thanksgiving! Awesome. Now I’m very hungry! Super cute ideas on your board! Yum, of course I was drawn to that chocolate fudge with pretzels! Oooh, Caramel Spiked pumpkin pie sounds like a winner of a recipe! That turkey cheeseball is awesome! I can’t pin mine, because it isn’t photographed, and hasn’t been published.. I have to have my family recipe for pudding candy, preferably butterscotch and lemon. Lots of butterscotch, with chopped walnuts! If I could, I’d pin the daylights out of it! Poo!!!! And I shop Kroger, ours is Fred Meyer.. One stop shopping.. And my birthday is 19 Dec., this would be perfect!! Be sure if you want to enter the giveaway you create a Pinterest board. Maybe with some delicious recipes you’d love to try this holiday season? I’ve already cooked a turkey last week, it was so good. I couldn’t wait 🙂 And that pumpkin pie with the lattice you pinned looks amazing!!! So colorful, thanks for sharing! LOVE the nut loaf shaped like a turkey. Very cool. Those nutterbutter acorns are awesome. What a fun treat to put on everyones plate, or a bowl in the center of the table??? A very well rounded meal, thanks for sharing! So glad you found me! That apple cider sangria sounds refreshing! THANK YOU AND THANK YOU KROGER FOR THE GIVEAWAY! THESE ARE THE THINGS THAT I ACTUALLY COOK EACH YEAR!! THANK YOU!! Thank you!! Oh, will try those for sure! Can’t wait!! I’ll bet they are amazing!! Here is my second entry- the healthy version!! I thought of an idea to do a healthier alternative to the other items I had created on my first entry!! Thank you and thank you Kroger for the chance to win!!! Im a HUGE Kroger fan, especially with the gas points! 🙂 YAY! here is my board. Happy Thanksgiving!